I’m still re-calibrating life after the exhilarating, exhausting month of May when all of my long-term projects culminated in completion one right after the other! From finishing graduate school to the final round of edits on Story of the Spirit (©2018) to wrapping up homeschool lessons for my son and RUNNING my first half-marathon—all goals I spent weeks and months preparing and training for. Graduate school was a two year investment. Researching, writing, editing, and re-editing Story of the Spirit has been a focus for eighteen intense months. Running 13.1 miles without dying or stopping to walk required a fifteen week training schedule. Big goals woven into the daily routines of mom life, wife life, teacher life, and trying to maintain some semblance of normal–human–status–in–the–real–world life! It has been a season of goals, and after the whirlwind month of May when everything seemed to wrap up at the same time, I found myself project-less in June. It’s been, well, a little weird. I thrive on goals and deadlines and projects, things I can point to at the end of the day and say, “That’s what I accomplished, and it was worth every effort.” But not everything worthwhile is so concrete. Yet that is Christ’s priority for me. And you. Sometimes the projects, the to-do list, the tangible tasks are easier, more satisfying, more defined. But they are not HIS priority for me today. 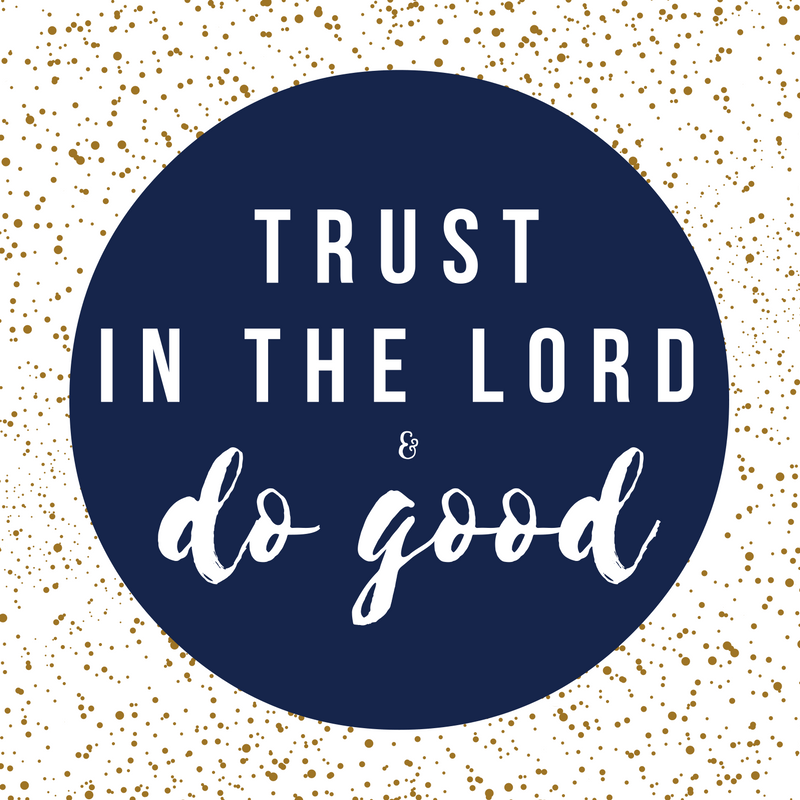 So after a bit of floundering, my simple plan for this oddly open season is a snippet of Scripture from the book of Psalms: “Trust in the Lord, and do good” (Ps 37:3). I’ve fallen in love with the simplicity of this verse! Whatever lies ahead, today, this day, this moment right here, right now begins with one simple choice. Making breakfast for my family. Good. Keeping the dishes somewhat under control. Good. Actually paying attention to the chatter of my soon-to-be-second-grader. Good! Whatever decisions loom ahead of you, whatever projects linger unfinished, whether today’s schedule is jam-packed or uncomfortably wide open, take a moment and ask God what trusting Him for THIS day looks like in your life. Ask Him what good lies before you in THIS hour. Maybe it’s setting the alarm a little earlier to scramble a few eggs, for yourself or others. Maybe it’s helping your youngest ties his shoes without grumbling about it. Maybe it’s picking a friend up and driving them to work without resenting the extra time it takes. Maybe it’s smiling at the co-worker you’re usually too busy to notice. Maybe it’s praying for that person that keeps coming to mind instead of putting it off for later. Maybe it’s cracking the Bible open during your lunch hour and connecting with Jesus. I’ve heard Psalms 37 is a great mid-day read! Life is rarely simple, but this snippet of truth is. There is good for you to do in this day. So trust God, and do the good before you. And whatever tomorrow brings, today will have been worthwhile. Previous postHelp! Which book blurb would you pick?